Versatile for any occasion – events, jobsite or sports. 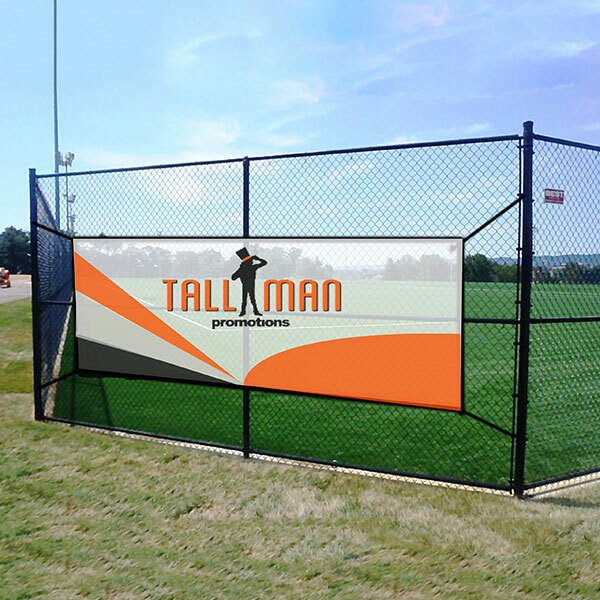 TALLMAN.PROMO has the banner you need to make sure your brand or team gets noticed. These are easy to setup and durable so you can reuse. Our mesh banners are a great way to add graphics or logos to any walls fencing or displays! They can liven up a ugly space or sporting event transforming it into something nice to look at. Mesh banners are a great way to display anything you want in various sizes at any event or trade-show. They are also great for advertising along fences or posts! The mesh allows for airflow to go through the banner, therefore it will not rip in high winds or flutter in comparison to other banners we carry. TALLMAN.PROMO mesh banners are good for indoor and outdoor events, which allows you to advertise or set up almost anywhere you can imagine. Mesh banners are economical, light weight, and allows 37% air-flow through making it ideal for building, stadium, and fence wraps. Generate attention with your banner! Garner attention by displaying your business or logo on a mesh banner from TALLMAN.PROMO at your next event. Custom sizing available for all mesh banners. This product are printed using inkjet printing methods. For more information, visit our Production Methods page. Mesh Banners are done on perforated or mesh vinyl. that is UV resistant and waterproof with a 2 -3 year exterior longevity. Indoor use will have a longer lifespan. Templates are available on request based on sizing. The mesh banner is lightweight which allows for airflow making them great for outdoor use and comes in a variety of material options. Made with all four sides hemmed, plus grommets on all four corners and approximately every 60cm. Mesh banners are available in custom sizes on request. Additional hardware is also available depending on the intended usage.